Home › Innovation and technical know how › News › EuroSkills 2018: a record number of medals for the Belgian team! 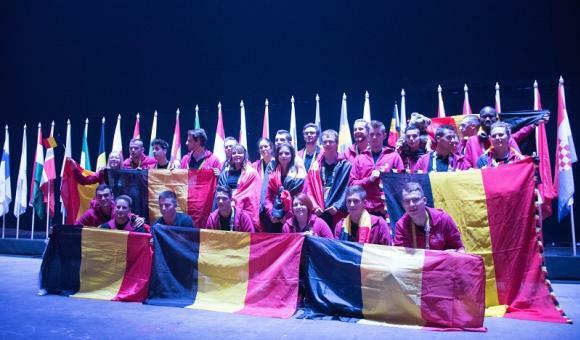 At the last EuroSkills event (the European championships for manual and technical trades), which took place in Budapest at the end of September, the Belgian team won one Silver Medal and 11 Medals for Excellence - a new record! Our 26 young people, all under the age of 25 - 7 girls and 19 boys - travelled to Hungary to represent Belgium in 23 out of 37 potential trade categories in competition. Despite the high level of competition (comparable to a World Championship) Belgium won 1 Silver Medal and 11 Medals for Excellence. This represents medals in 55% of trade categories in which our country took part (12 trade categories out of 23). Belgium was the country with the most Medals for Excellence - 11. The Russian Federation, Austria and France emerged as the big winners at this European Championship. Maxime CABO, 21 years old, from Havinnes in the Province of Hainaut, studying at the Haute Ecole de la Province de Namur, coached by Expert Cédric Vandervaeren, in the category "Hotel - Reception” won a Silver Medal. Landscape gardening: Jonas MENSCHAERT, 19 years old, from East Flanders (Zottegem), studying at Bernardus Technicum and Dylan LEKEUX, 20 years old, from East Flanders (Idegem), studying at Bernardus Technicum, coached by Expert David Hermann (Die Gärtnerei Hermann). Tiling: Maxime DENGIS, 21 years old, from the Province of Namur (Spontin), Independent, coached by Expert Daniel Bertholomé, Forem ConstruForm GrâceHollogne Training. Hairdressing: Florine CAPELLE, 23 years old, from the Province of Liège (Liège), on a work-study programme at the Liège IFAPME Centre, working at Arty Style, coached by Expert Jef Vermeulen, Coiffure.org. Mechanical Engineering Design - CAD: Lucas SCHOLZEN, 24 years old, from the Province of Liège (Vieuxville), studying at the University of Liège, coached by Expert Jean-Michel Neven, from the Haute Ecole de la Province de Liège. Cooking: Jordan BOREUX, 21 years old, from the Province of Luxembourg (Rochehaut), working at L’Auberge de la Ferme, coached by Expert Frédéric Deroppe, Horeca Training Wallonia. Fashion Technology: Alice BARE, 19 years old, from the Province of Liège (Huy), studying at HELMo Mode in Liège, and Florence LASSANCE, 18 years old, from the Province of Liège (Malmédy), studying at Sainte-Claire Verviers, coached by Expert Christelle Cormann, HELMo Mode Liège. Graphic Design: Jordan RUBENS, 23 years old, from the Province of Liège (Stembert), working at 20Something, coached by Expert Thomas Palacin-Danthine, Deuux. Electrical Installations: Florian EVRARD, 18 years old, from the Province de Namur (Ciney), studying at the Ciney ISJ secondary school, coached by Expert Jean-François Delerue, Forem – Mons. Joinery: Pierre BALANCIER, 18 years old, from the Province of Liège (Pepinster), studying at Don Bosco Verviers, coached by Expert Patrick Bergenhuizen, Don Bosco Verviers. Restaurant service: Clément JACQMAIN, 21 years old, from the Province of Namur (Blaimont), studying at the Haute Ecole de la Province de Namur, coached by Dominique Bal, Hotel School of Namur. Welding: Brenda VERMEIREN, 25 years old, from the Province of Anvers (Kalmthout), working at Pito Stabroek, coached by Expert Raphaël Colle. Finally, Alice BARE and Florence LASSANCE, in the Fashion Technology category, received the highest score out of anyone in the Belgian team. This earned them the honour of ascending the podium alongside the other national champions at the closing ceremony. Congratulations to the Red Bears for their excellent results, and see you in Kazan for WorldSkills 2019!